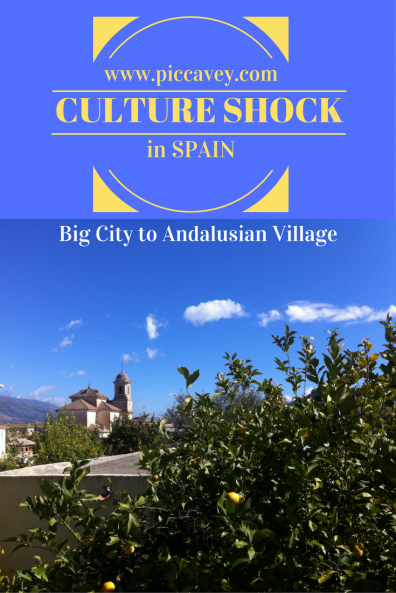 Did you know that tyou can suffer from culture shock even when you speak Spanish? 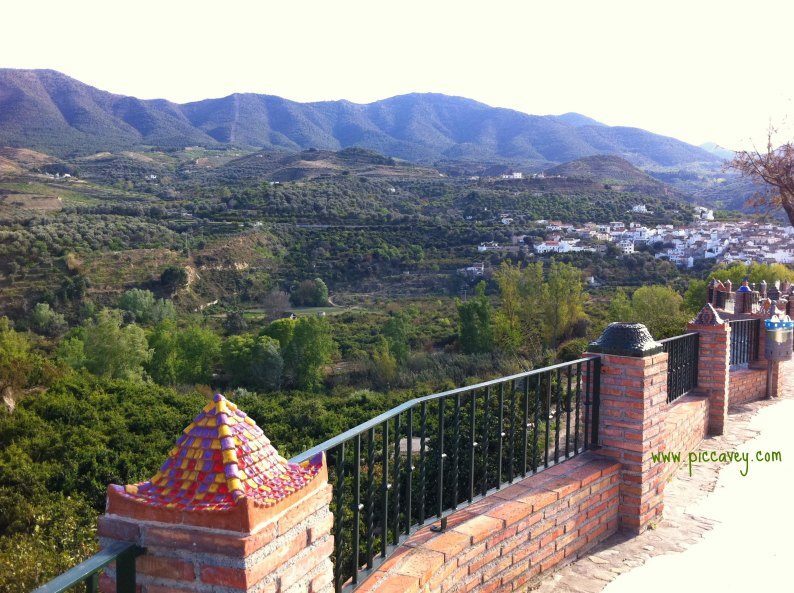 You may already know that I moved from Barcelona to Andalusia, Southern Spain back in 2006. Even though this is over 10 years ago now, I want to share this little story to show that expat life isn´t always a smooth ride. At the time of planning, I wasnt ruffled about a move to Granada. As I already moved from Nottingham to Barcelona barely speaking Spanish and had done OK. No signs of Culture Shock or anything much really. I was quite sure that moving from one Spanish city to another would be a breeze. I already knew I had a group of like minded colleagues at my new job, they would help me to settle in. After 8 years in Barcelona, I spoke a good level of Spanish, so no worries there. I really thought that in no time I would go completely unnoticed in a city of 200,000. Each morning the bus left the village and would arrive to the city at 8am. This fit perfectly into my timetable as I had an 8.30am start. A short walk from the bus stop to the office seemed a simple journey each day. The first day I caught the bus, I realized that it wasn’t just your average commute. Getting up at 6am, to be at the bus stop by 6.25am (Bus stop shown above) wasnt much fun. The bus route snaked along winding high roads connecting many small villages. This service is the only way to get into the city. Steep gorges on one side of the bus and hairpin bends didnt invite reading on the way, nor listening to music. All I could do was just face forward. It´s the first public bus service with sick bags on board that I´ve seen. The 100 minute journey to and from work each day was not going to be much fun. As we wound around the tight curves and passed endless trees and cottages we approached a hamlet (about 40 houses) to pick up more passengers. The bus had to do a tight three-point turn to get in and out of the village. The main road was barely wide enough for 2 cars. As passengers got on the bus and pay the driver, they begin to move along to find seats, about 8 people got on at this stop. I noticed that they all stared at me blatantly. However they did pay any attention to the other passengers. They look at me as they approach my row and as they are going further along even turning their heads to get a longer look. When we stopped again at the next village the same thing happened. By this stage I am starting to wonder if my hair is stood on end after the scary bus ride. Maybe I was off colour after so many twists and turns. I had no idea what is it was that is attracting so much attention. When I got home that evening I commented about the bus ride, wondering why they were looking at me. I was told that it is because I´m unknown to the locals. As they know everyone who catches the bus everyday. Which family each passenger belongs to. So because I was a stranger they weren´t best pleased I was catching their bus and not chatting away with them, sharing who I was and what I was doing. I still had a lot to learn. 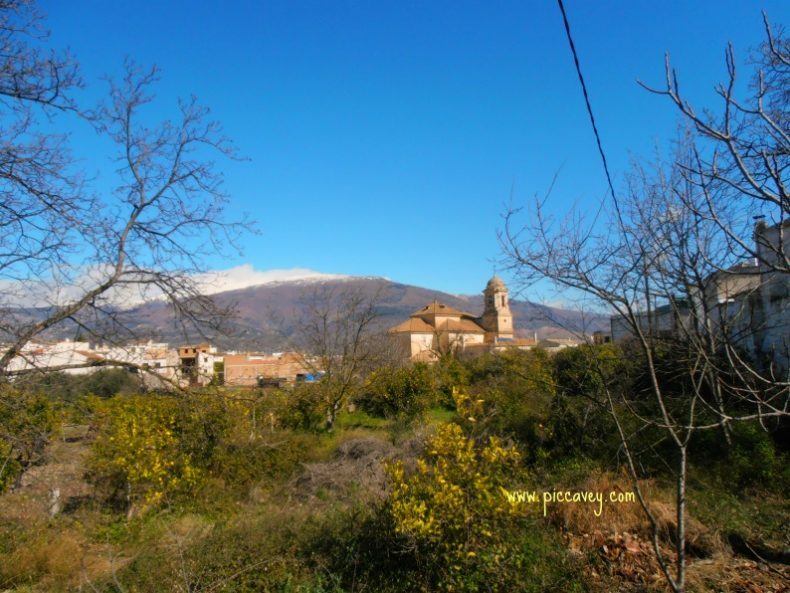 The next day I went along to the bus stop, already knowing that I would have 30 minutes of windy roads and then we would go onto the motorway where I would be able to read happily until we got to Granada. I also was prepared to be gawped at. No problem. When I arrived to the bus stop I waited noticing that it was still dark (this was early April) just a chink of light on the horizon. The bus stop doesn’t have a notice board, bus shelter or any distinguishable markings. All the people in the village just know that the bus stop is there, on that patch of road. 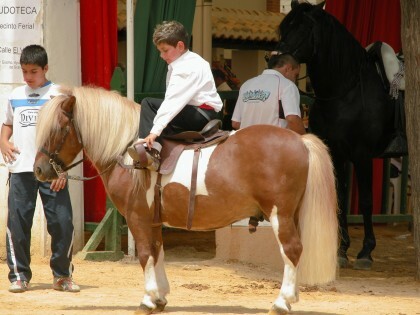 Quite typical in many areas of rural Spain. Most days I was the only person at the bus stop. (picture above) There I was waiting for the bus. At the spot where I stand there was a small parcel of land directly behind it. Like an allotment or small garden, with onions, lettuces and a few trees. On the edge of the plot was a large fig tree. Typical in the area with wide hand shaped leaves, almost brushing my head as I stood on the other side of the fence. The fig tree caught my attention as the sturdy lower branches were swaying. I looked around me but soon notice than the other trees are still. No breeze at all. Again the fig leaves move and continue to sway. I have no idea what was in the fig tree. The branch was sturdy and strong. It couldn’t be a bird or a squirrel, it had to be something bigger than that. It couldn´t be a person at that time in the morning, it was still dark. I tried to keep calm. The bus will soon be here. Now I do know that Wild boars are common in the Valley of Lecrin and Alpujarra area. I couldn´t bear to think I was just a few steps away from a wild boar. And on my own at 6am in a rural village in the middle of nowhere. The branches didn´t stop moving. After what seemed ages (but probably 5 minutes in real time) the bus appeared. I couldn’t work out what an earth it was there even after calming down on the bus and thinking about it rationally. After several days of catching the bus, I got used to 3 or 4 villages dogs chasing me along the street every morning and the winding journey to the city of the Alhambra. It was a refreshing contrast to see such lush green landscapes on my way to the shiny corporate office that I worked in. Soon afterwards I discovered what terrifying creature was close to the bus stop. On the other side of that lush fig tree was the sweetest little tan coloured pony. Probably the cutest thing you could imagine. A local told me that it´s owner occasionally changes the grazing spot every now and again. Six weeks later I moved to Granada city centre. 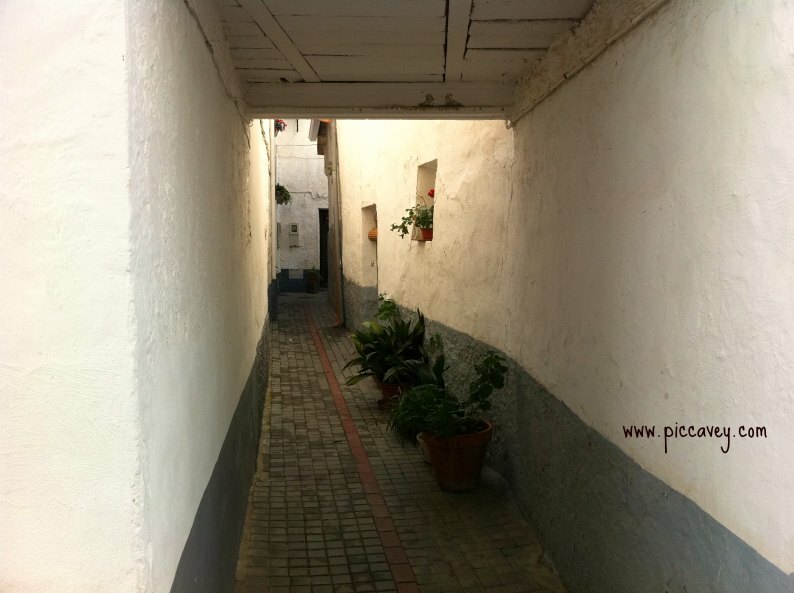 Settling into my city centre apartment in Granada was simple after the tribulations of rural village life. During that first week in my new flat I heard a deep rumbling sound, then I felt the floor shake. All the glasses and bowls in the cupboard were tinkling and shaking too. It turns out that Granada is an area that has Earthquakes every now and again…..
Not only was I experiencing Culture Shock I now had to learn about what to do in case of an Earthquake. Moving abroad certainly keeps you on your toes. Have you experienced Culture Shock when living or studying abroad? I love reading your blog. Could you tell us a bit how the Spanish economic crisis is affecting your area? Are you ever concerned about your personal safety? Is it as bad as the TV reports suggest? Thank you. Are you ever concerned about your personal safety? Never. I feel that I live in a very safe place, hardly any pickpocketing or violence around here. In the UK I wouldn´t walk on the street alone at night but here I feel very safe. It is a very family orientated place and neighhourhoods are communities where people tend to know each other. I enjoyed that Molly. Made me think back to when I first arrived in Granada city, several decades ago. On a train from Madrid, having arrived there from Ireland. No airport in Granada back then. I spoke fluent Spanish, and although I was the only non-Spanish person on the train I was quickly drawn into conversation by the others. I seem to remember the trip took maybe eight hours. 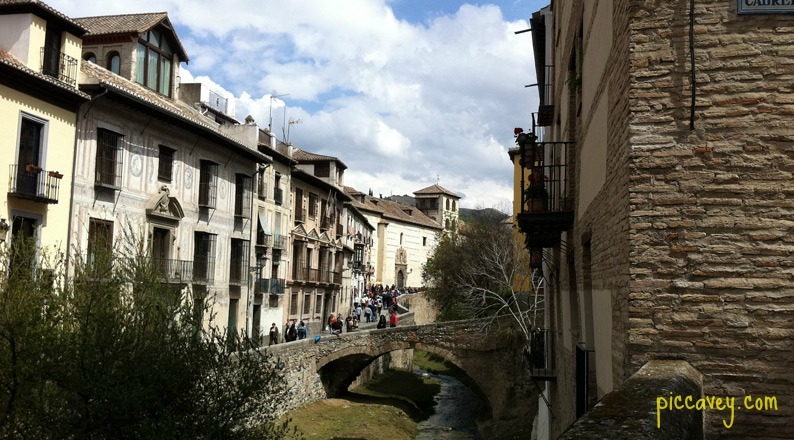 By the time I reached Granada I felt as if I had lived in Spain forever. I can assure Matt that I never had concerns as regards my personal safety and never a bad experience. Complimentary sick bags? I have only ever seen those on airplanes! Good for you for sticking it out on the bus, that couldn’t have been easy. 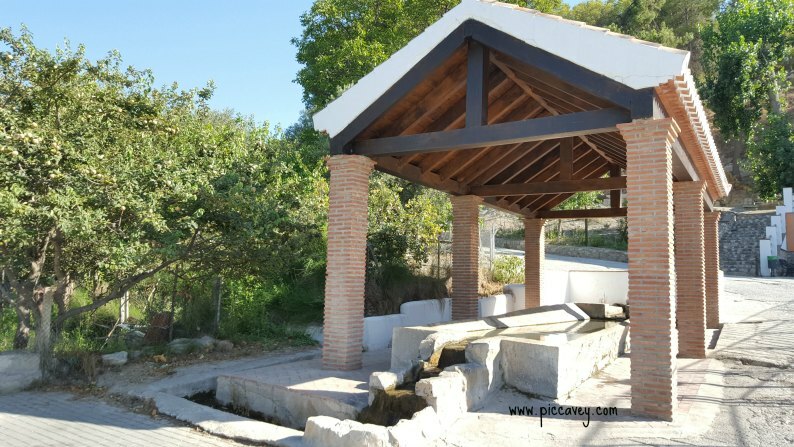 Very ‘human’ story Molly – and a great ‘slice of rural life’ in Spain. As a bus user myself I can really relate to it . I actually got mugged in Fuengirola town centre while walking to the bus stop at 7.30am in the dark – would much have preferred an encounter with a wild boar! I love that Molly I live in a tiny village and can completely relate. Every day is an adventure here isn’t it? Hello Molly my husband & I have been searching for a home for our retirement I came across your blog, how wonderful and such a brave lady.. Well done you. 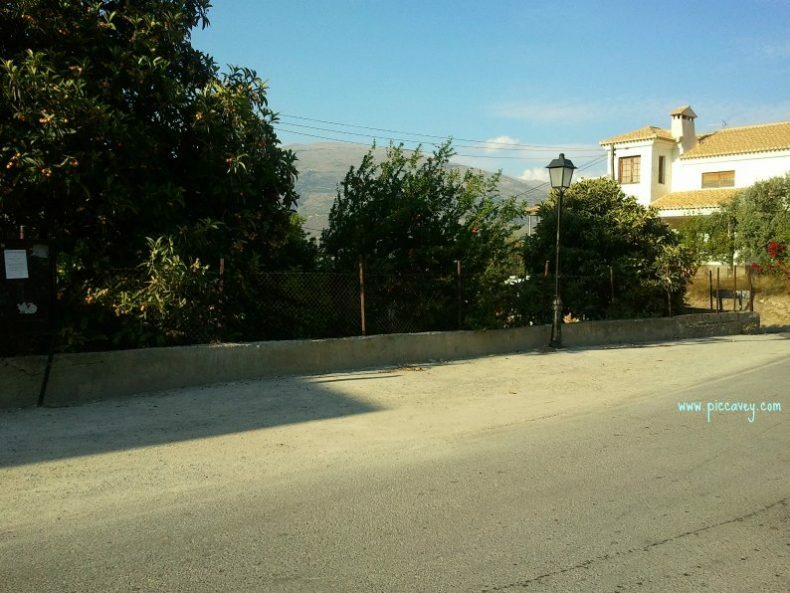 I think we have found the perfect place in Andalusia Granada Iznalloz a lovely 2 bedroom apartment on what seems to be a lovely quiet complex…. Any advice for the move Molly ? Hmm Yes, at first I would really recommend renting a property for at least 6 months (ideally a year) before committing to one place. Your blog post was very insightful. I loved reading every bit of it. Speaking of culture shock I think I’ve faced more of it in my own country than out of it. This was more because I came from the quiet broad minded state (Goa) and moved to another state where cultures are different and live is far more fast faced.